NEW YORK—With a live band keeping the beat, Democratic mayoral nominee Bill de Blasio lent his support to the New York State Nurses Association (NYSNA) on Oct. 17 just outside City Hall Park. “If you are going to change the world, you are going to have to have some music to go with it,” de Blasio joked. 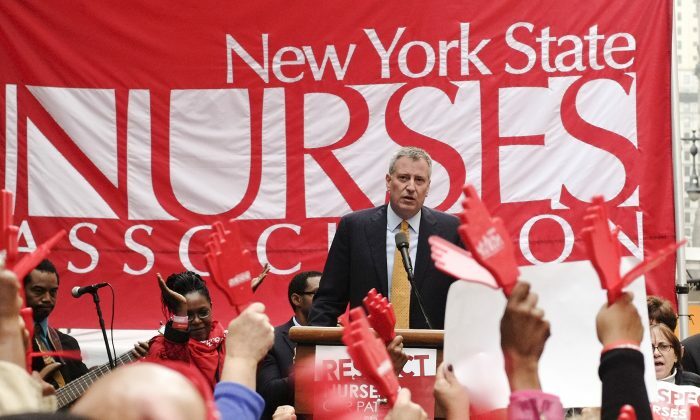 Speaking before a crowd of several hundred nurses, who were in town for their annual nurses convention, de Blasio thanked them for their work and promised to deliver a fair contract if elected on Nov. 5. The nurses union has been out of contract with the city for over three years and is one of the roughly 100 city unions the next mayor will have to negotiate new deals with. Current Mayor Michael Bloomberg has not negotiated new contracts since the recession hit, citing a lack of money in the budget. The Bloomberg administration has put forth several deals that unions have refused to accept, largely because they don’t include back pay, or will require the unions to pay for a portion of their healthcare premiums, something 90 percent of the municipal workforce does not currently do. NYSNA endorsed de Blasio in his bid for mayor.